CIFS performance was evaluated using Intel NASPT. 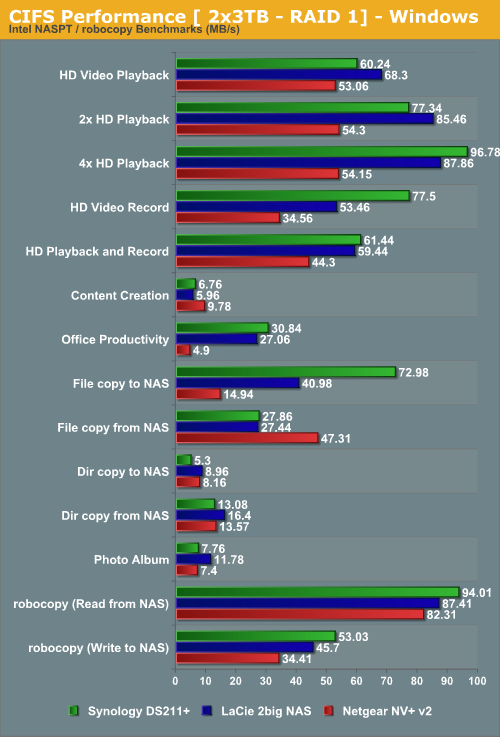 While the Netgear NV+ v2 was evaluated using RAIDiator 5.3.5, the LaCie 2big NAS was running firmware version 2.5.6.2. 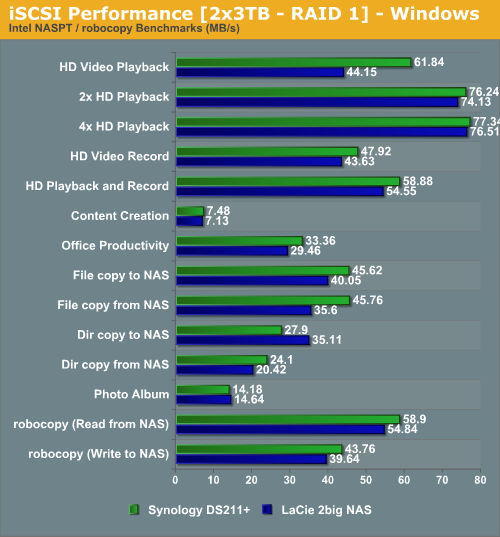 The Synology DS211+ was running DSM 4.0. Back in November, we obtained much better results for the Netgear NV+ v2's CIFS shares. Although that was on a different testbed and used different disks, it is surprising to see such a drop in performance. It is possible that the introduction of new features / services running on the NAS has an adverse effect. However, note that the robocopy benchmarks figures haven't changed much. It is only in other types of accesses (such as HD video playback / recording / opening and closing small files and documents) that the drop in performance is noticeable. Netgear doesn't offer iSCSI in the NV+ v2 / Duo v2 lineup. However, LaCie and Synology do. We refreshed the benchmarks for the LaCie unit. Currently I'm operating a Synology 209+ and a Netgear Ultra 2. From my point of view the Netgear is acceptable" as a backup device, but as a more general server it is miles and miles behind Synology. The user interface for one is just ancient on the Netgear, even though it's a newer model with more CPU and more memory. The software on the Synology unit is way better. I'm running with it as a small LDAP server and connects Windows7, Mac and Linux clients to this. The media sharing sw on the Synology is by far more comfortable to use. I have 3 NV+'s, and have always been impressed with their stability and the UI from a home user and a power user standpoint. Their throughput is slower than pretty much everything else I have tried, but for me the stability and ease of setup were worth the tradeoff. I should have waited for the price to come down (I paid $1100 for the first diskless unit, and they are $250ish now). I wish they made one that supported more disks (8 or more) so I could move off my 20 disk 3 TB RAID60 array on my server that I have most of my stuff on. The NV+ work awesomely for backup purposes now.